Dr. Neufeld speaks to the question of “what to do when …”, but does so in the context of the larger question of what is required for healthy development. Some of the prevailing discipline practices – like time-outs and consequences – are discussed from this perspective. Strategies are provided that are attachment-safe and developmentally friendly. The guidelines and principles apply to children of all ages. Most every parent and teacher wants to know what to do when ….. This tends to be the most pressing and universal issue in dealing with children. Finding the right answers to these questions becomes more challenging when parents and teachers are concerned about issues like attachment and healthy development and do not want their discipline methods to undermine or sabotage these processes. At the same time however there is the responsibility to teach the lessons that need to learned and to impose order when required. This course speaks to the question of what to do when …, but does so in the larger context of what is required to raise children to their full potential as human beings. Some of the prevailing discipline practices - like time-outs and consequences - are discussed from this perspective. This course provides participants with the opportunity to develop a comprehensive approach to discipline with strategies that are attachment-safe and developmentally friendly. This session traces the six traits of well-behaved children to their developmental roots. Surprisingly the keys to consistently good behaviour lie not in learning or discipline but in right relationships and in healthy brain functioning. These traits are spelled out and their developmental roots revealed. This session looks at the most common methods used today - alarm-based methods, separation-based methods, and consequences - and explores their impact on the six traits that underlie good behaviour. Guidelines are given for when consequences are appropriate and when they are likely to backfire. This session offers effective strategies for handling incidents as well as for addressing the deeper roots of problem behaviour. In addition, discipline methods are provided that double as powerful primers of maturation. This bonus session is from the Power to Parent, Part III. This session looks at why the most common discipline methods do not work with stuck kids and then provides eight guidelines for disciplining children who do not feel futility when it is encountered and who lack mixed feelings when they should have them. 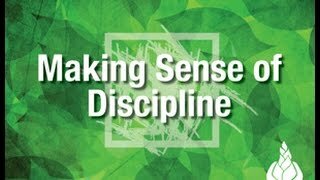 The tuition fee for taking Making Sense of Discipline through continuing education is $125. This includes a virtual campus student pass of four months to access the videocourse material as well as other supporting materials. If a personal copy of the DVD set is desired, the tuition fee is $175. Neufeld Institute Faculty member Genevieve Brabant is the acting coordinator for this course.